This article is written by Mr. Bhargav P Vasavada. ‘Usi ne ha lootaa, mazaa zindagi ka, mohabbat me jo ho gaya ho kisika‘. When it comes to the ‘lootaa…‘ part, an engrossed listener would feel as if there is a sudden spurt of intoxication after all the intensely peaceful imbibing that has been going on till then. We know the shift in gears that Rafi Sahib was uniquely capable of doing, yet we wonder how come there is still that bit extra every time he paired up with Shamsher Singh Kapoor, better known as Shammi Kapoor, the icon almost singularly responsible for changing the image of the lead actor to a rebellious lover brimming with confidence and charisma. It’s that era that we are going to focus on today. Of course there are some other very important pieces to this jigsaw, namely O P Nayyar, Shankar Jaikishan, Majrooh, Shailendra and so on. The very fact that when we close our eyes and think of the Shammi era, the term ‘music’ brings up the name ‘OP’, goes on to show the heights achieved by the master in the good old days of Kapoor’s kinly association with Shankar Jaikishan. With due lack of respect to the storylines and directions, it would be an understatement to remark that some of the flicks around then were made worth remembering purely because of the genius of Rafi-Shammi Siamese duo. It almost seemed they had the music ready to go, but somehow they had to knit a story and some side cast around it for packaging purpose. Whether it was the royally inglorious ‘Prince’ or the princely mediocre ‘Rajkumar’ or the equally average ‘Kashmir ki Kali’ – all of them were fortunate enough to carve a place in the annals of Hindi music, purely because of individual brilliances of SK, RS, OP and SJ. Which lesser mortal, if not already aware of it, would be able to claim its a dubbing when Shammi approaches Sadhana crawling on all fours acting out ‘vo dekho mujhse rooth kar meri jaan ja rahi hai‘. Rafi sahib is the best mimic of all time, having mimicked with finesse to give voice to a galaxy of actors. Though somehow, perhaps just by design, it seems even the mimic didn’t have to be anything but at his natural most, when it came to singing for Shammi. Of course great credit to the actor as well, else who would believe the way he fools the audience in ‘hai duniya usiki…’ into believing for a moment that a second Rafi was born – or was it that Rafi tried this number in a spiritually uplifted state as well? It never happened with Shammi-Manna combo somehow, although the music was melodious as ever. You never feel the same onscreen chemistry in ‘jhoomta mausam mast mahina..’ although Manna da is bright as ever in the foot tapping classic. It is not surprising thus, that SK himself was quite good at appreciating music. He played an active role in the selection, creation, recording and concept of his music and the final filming of his songs. In fact few know that it was Shammi-Rafi who had decided in consultation with OP that every ‘taarif’ in ‘taarif karun mai kya uski‘ would be rendered differently by RS and would be differently enacted each time by SK. Such were the days of versatile artistry and teamwork. SK once recalled that when OP was zeroed on for Kashmir ki kali, he was ready with 52 tunes, from which the bosses RS and SK selected 9 of the best! Talent can sometimes be a quality for lifetime! After Geeta Bali’s death, ironically associated so much now with the real life like acting in ‘Tumne mujhe dekha..’ by SK, he was to lose interest and cut down on his work. However flashes of SK-RS brilliance did keep coming as in the pahadi based ‘dil ke jharokhe me…’ I sometimes try to sing this number out of sheer disregard to greatness, only to realize my lesser mortal stature very soon. From the chocolate like, almost childlike ‘hum aur tum aur ye saman…’ to one of the best lullabies in ‘mai gaon tum so jao…’ over the years, this pair has given us a reason – reason to smile, reason to be ourselves, reason to just forget our self importance in presence of something supremely sublime. This entry was posted on Tuesday, January 1st, 2008 at 2:45 pm	and is filed under Meri Awaaz Suno. You can follow any responses to this entry through the RSS 2.0 feed. You can leave a response, or trackback from your own site. I have no words to describe the chemistry between these two legendary personalities. However, I think Shammi Kapoor’s whole romantic attitude to life is personified in the song “Meri Mohobbat Jawan Rahegi” from the film Janwar. And the way Rafi has performed it gives me the goose bumps every time I hear the song. It is true that the voice of Rafi ji suited Shammi Kapoor so much. Whether is a boncy song like yahoo or aasmaan se or romantic song like is rang badalthi or a sad song like hai duniya usiki every song was a perfect . With Shammi kapoor’s demise we have lost the pair of melody . Rafi’s calibre and class is absolutely unmatchable, and most music lovers believe it will remain so in time to come. He generated a new ultimate, untouchable class of his own and gave new dimensions to “perfection” in singing. All other singers of his time and of today are not even an inch of his enormous versality. He invented new styles, new moods for the film singing, hiterto, unimaginable for music lovers. Billions people on this planet firmly believe that with Rafi, the ultimate perfect singing is gone. This is a very interesting article. I believe that the magic formula of Shammi Kapoor/Mohammed Rafi will remain unique and inimitable in the annals of Indian cinema. They were both highly talented artists. Shammi was a great actor and Rafi was a brillant singer. Shammi is still a musical person and his knowledge of music is unbelievable. His rock n roll influence in many of their tunes is obvious. It would be impossible to fail to mention the contributions of the two greatest musicians of Indian cinema, Shankar-Jaikishan and also O.P. Nayyar. Great article. What else can we expect from two giants in their professions? They were perfection in sound and movement. Best timing between song and acting. Rafi ki awaz Shammi ke jism ke her ang se nikalti maloom padti thi. Well great article, I love your writing style and, writing about legend shammi kapoor. Kapoor.No other sound is matching for SK as Rafi Saab’s. THANKS FOR YOUR EXCELLENT ARTICLE ON RAFI – SHAMMI COMBINATION SONGS ! ACTUALLY, ALL SONGS OF RAFI SAHAB RENDERED FOR SHAMMI KAPOOR ARE LIKE : ” SONE PE SUHAGA ” ! Bhargavbhai, my appreciation for a very good article on these two legendary personalities. O. P. Nayyar: Tum Sa Nahi Dekha altogether changed SK’s image for good and from where he never looked back. Two more movies Basaant & Mujrim followed which I think did not fared well on Box office. Despite subsequent Kashmir Ki Kali hit, there was no OP-SK combination thereafter. Usha Khanna: Dil De Ke Dekho an out and out hit movie, Asha Parekh made her debut, all the songs hit. There was no repeatation of UK-SK combination thereafter. Ravi: China Town again a musical hit. One more movie by Ravisaab for SK (Pyar Kiya To Darna Kya) with a beautiful song, “Jaane Bahar Husn Tera Bemisaal Hai”. They did not come together therafter. Probably, the movie not doing good business was the reason for the same. Kalyanji Anandji: A Manmohan Desai movie in which KA used 3 singers for SK, Rafisaab, Mukesh and Hemant Kumar. Though musically hit (who can forget Govinda Ala Re), this pair never come together again may be due to the same reason – movie did not fare well at Box Office. R. D. Burman: The most surprising one. Despite all time hit, a landmark movie, all hit songs, RD-SK never teamed up again. So far as my knowledge the above is factually correct. If not, I may be corrected. I am sure our knowedgable forum would able to provide clue about my above puzzle. Binuji can even talk to SKsaab himself to find the answers. Hats off, SSmakkar Ji and Zorawar Ji, for your posts on the “Tu Ne Mera Yaar” song from Film:Shama Parwana(1954). Whenever I hear this song (especially the ending), my heart becomes heavy and I keep feeling so sad for Rafi Saab. When I hear the words, “Nahi To Aake Mujhi Ko Phir Is Jahan Se Uthaaaaaaaaa, Aaaaaaaaaaaaaaaaaaaaaaa”, it sounds to me more like an orphaned infant crying breathlessly at the highest pitch! I often think of Rafi Saab’s Godliness because he evokes such intense emotions/passions from genuine music lovers, which no other human could. Fantastic article. I cannot even think of writing an article on this jodi as I have no words to explain this combination but the way it has been expressed here, I feel may be I can also pull out something now and add further. But for Mr. Ashish Kapoor, as I also have the full record of Shama Parwana and I have been hearing this song for last 20 years and rehearsing also but that last part referred to by you cannot be imitated if even you “faado” your voice. That last part of the song shows the feelings, the passion and height of love that male character possesses for his beloved. Coming back to jodi, after the final edit of the song Tumne Mujhe Dekha, even Shammi Ji admitted that he should have done something better to justify Rafi Sahab’s singing. Considering the calibre and position that Shammi Ji had and the way he acted in this particular song, I think that’s a very big statement. Dear Mr. Bhargav, do keep on posting such good and peaceful articles to keep our blood flowing at 120/80. Thanks. NAVIN NICHHAL, VIJAY ARORA, SACHIN, RAJ KIRAN, ARUN GOVIL ETC. kya daur hoga wo bhi jahan rafi sahab jaise jaadugar perform kar gaye hain………. Mehtab Ji is very right regarding the “Tu Ne Mera Yaar” song by Rafi Saab in Shama Parwana. Don’t you think it is truly a divine rendition over the entire 04:52 duration? This song is supposed to be an extremely tragic song in the film and especially the last Antara, during the words, “Nahin To Aake Mujhi Ko Phir Us Jahan Se Utha”, was meant to be heart-rending, at the highest possble scale possible for humans , much the same way as an infant cries breathlessly and makes the listeners die with compassion! So, in this noble process, if there was a streak of voice-break, it was very much intended. After all, the MD, Husnlal Bhagatram, a stickler for high quality would have gone for another recording otherwise! Mein Rafi Sahab ka bahut bada fan hoon. Main kya likhoon meri to samajh mein hi aa raha hai. Itna hi kah sakta hoon, I love him very much. i am a rafi sahib bhakt. yes there is a second crack there- no doubt- but seeing the emotion built up and the energy generated by the by the rendering, the music directors decided to retain the element as a very natural eomtional break. the song is still beautiful. i may inform you that mahendra kapoor ji sang this very song in the murphy singing competition to win the first prize, where naushad sahib and br chopra were the judges.his career was launched thereafter. 1.- I can not imagine that RAFI SAHAB KI AVAAZ FAT GAYEE. 2.-Though I have not heard the referred songs, it is difficult for me to digest the same as mentioned in your article. Nice article from Bhargavji, Rafi was the instrumental idol for Shammi Kapoor’s films. He sang most of the song for shammikapoor. One song is my favourite “Mein Gaau Tum So Javo”, film “Brahmachari”. what an song it is 2 version one is happy and another sad. 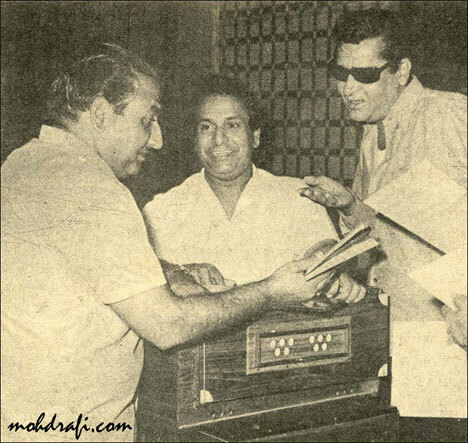 Whatever will be Rafisahab sung most of the songs with the music director shankar-jaikishan baton for Shammi Kapoor. Dear Mr. Ashish Kapoor, I have also the songs of Shama Parwana, which I recorded from the DD1, when this film was telecast almost 25 years ago. Actually, Rafi Sahib’s voice has not torn in this song. This was only the demand of the story. The Director wanted to show the Hero’s passion of singing through the song of Rafi Sahib. Why such a mistaken or errorfull recording would be taken to the Public? It can be understood easily. When there was an option of re-recording was available, then what was the need to make it public? Rafi Sahib is such a great singer of this planet who is absolutely up from such mistakes. I am a great fan of Rafi saab and have been reading many good articles in this website. It is indeed a great pleasure to see so many ardent fans of Rafi sab. When I see so many Rafi fans I am now confident that the name of Rafi saab shall remain in every Indian’s psyche for centuries to come. On the topic of Shammi-Rafi–can anyone believe that a singer who can sing songs like O duniya ke rakhwale/Ye mehalon..ye takhton ye tajon ki duniya can sing with equal expertise a song like taarif karoon kya us ki..etc. That’s the versatility of Rafi saab. and so on… Please note for so many not-so-popular music directors, only our ever-humble Rafi saab used to sing so many songs. That was his greatness. If you start counting the hit songs of this pair, we will keep counting for hours together. I would just like to narrate the following which I have read somewhere. It seems Shammi Kapoor himself was a good Singer. When somebody asked SK why he does not sing his own songs, it seems SK replied, “Yes, I sing well, but Rafi sings better”. SK has admitted that when he wanted to suggest certain changes in a particular song, Rafi would always come out with those changes even before SK could take up with him. When SK enquired as to how he could guess what he wanted, Rafi would say that he thought that the change would be needed to suit SK style. Such was the chemistry. When Rafi passed away, SK was on tour to Vaishno Devi. A tourist broke the news to SK and SK remarked, “My voice has gone”. Post # 7: Rafi Saheb ki awaaz faat gaee….. what do you mean? I too have songs of Shama Parwana, it’s nothing like what you have said. It was his way of the singing those songs. and reported in the media…..
binu nair… the rafi foundation… binus2000@hotmail.com..
well written article Sir and you have covered a lot of ground on the subject. also your language is journalistic. rafi sahab and shammi kapoor had the best pairing what with almost every movie churning hit songs after hits. most boisterous would best describe some of the songs like yahoo-chahe koi mujhe junglee kahe, aasmaan se aaya farishta, kisko pyar karoon, tarif karoon kya uski, etc. then there were songs whose tunes were not ordinary like for instance – is rang bhari duniya mein and voh dekho mujhse rooth kar meri jaan jaa rahi hai etc. Like Mr. nawathe has said, we are still enlivened by these roaring numbers even 40 years later. and it is true, but for rafi sahab’s songs, not much would have happened to shammi kapoor with his limited acting skills. Thanx for the superb article, Bhargav ji. Rafi sahab and Shammi ji made one heck of a team. Rafi sahab revealed another dimension to his singing, hitherto unknown to the music lovers, when Shammiji hit the big screen with his yahoo image. 1.- Really a masterpiece article on RS/ SK pair.My compliments. 2.-One can just remember DEEVANA HUA BAADAL or ISHARO ISHARO or DIL TERA DEEVANA HAI SANAM or IS RANG BADALTI DUNIYA ME..etc….and come to the conclusion that, RAFI SAHAB was the only voice for SK. 3.-Ultimately, they produced such a QUALITY WORK that, we are talking about the same after 40 years with the same interest..this is their true success. Rafi Saab was the driving force behind Shammi’s success. He matched each and every movement of Shammi to perfection, which possibly could have not been possible for any other singer. dear mr. bhargav, good article. Rafi Saheb was the voice of Shammi Kapoor from his begening to end of his carrer as a hero and his yahoo image owed to Rafi Saheb for songs like “Tumsa Nahin Dekha”, “Dil Lenewali Dil Dena Dekho Ji”, “Sahe Koi Mujhe Junglee Kahe”, “Badan Pe Sitare”, “Yeh Chandsa Roshan Chehra”, “Asman Se Aaya Farista” , “Aaj Kaal Tere Mere Pyar”, and many more …………………………….. . Its a matchless combination. Wishing all Rafians a very Happy and Brightful New Year, 2008. A nice but very short article specially when it comes to Rafi Saheb and Shammi Kapoor. World knows the musical relationship between these two artists. Shammi Kapoor’s movies were hits just because of Rafi Saheb’s songs. When people went to see Shammi Kapoor’s films, they knew that the songs were sung by none other than Rafi Saheb. The relationship between these two artists is unforgetable.